More than 550,000 whole-body cryotherapy sessions have been performed around the world since 2011. Cryotherapy has become an increasingly trendy “therapy” in recent years in the alternative healthcare space. Even well-known celebrities and athletes, like LeBron James and Shaquille O’Neal, have reported using cryotherapy to support exercise recovery and performance. While cryotherapy might seem like a novel and exciting concept, the use of very cold temperatures to reduce pain, support healing and elevate moods is actually nothing new. People all over the world have used cold packs and ice baths to promote healing for hundreds of years. What are the health benefits of cryotherapy (also called whole-body cryotherapy or simply WBC) according to the latest research? There’s some evidence that cryotherapy has anti-inflammatory, anti-analgesic, and antioxidant effects. However study results have been mixed overall, since not every study has found that cryotherapy is any better than rest and stretching for decreasing symptoms like muscle, bone and joint pain, fatigue and soreness. It’s important to point out that the Food and Drug Administration (FDA) does not currently regulate the use of cryotherapy offered by“cryotherapists” at cryotherapy centers, nor does it recognize any of its medical benefits. This means that if you do choose to try cryotherapy, be aware that there are some potential risks involved. Cryotherapy is a type of treatment that involves exposure to extremely cold air. 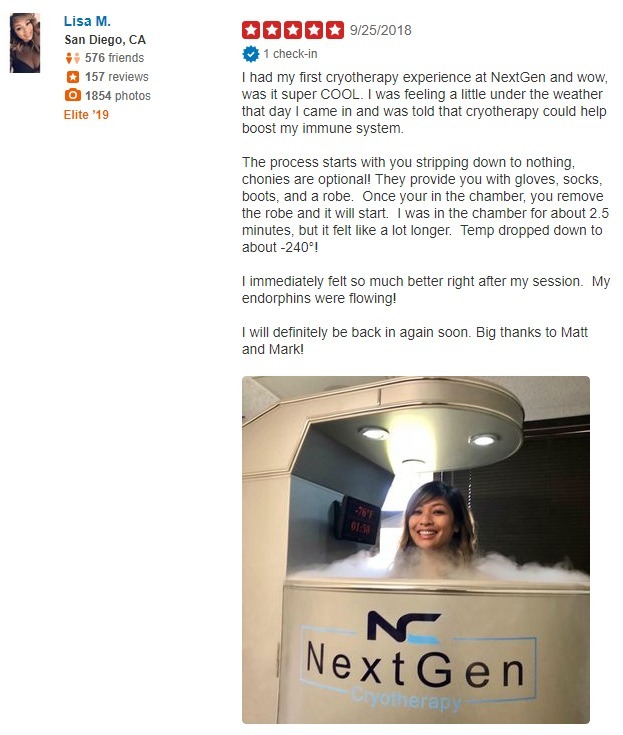 One definition of cryotherapy is “A technique that uses an extremely cold liquid or instrument to freeze and destroy abnormal skin cells that require removal.” The extreme cold comes from liquid nitrogen or argon gas. What is the point of cryotherapy? Even though it’s possible that some may experience improvements in their health following cryotherapy session, this has not been proven in many studies and is still widely disputed by some experts. In fact, according to a 2015 Cochrane review that included results from four laboratory-based randomised controlled trials that focused on the effects of whole-body cryotherapy, there is “insufficient evidence” that cryotherapy helps to treat symptoms like pain and soreness. The same review stated that studies included has also not been able to show that cryotherapy does in fact improve recovery times in athletes when compared with rest. On a positive note, the Cochrane review did found that in one study participants reported improved “well-being” and less tiredness after cryotherapy following exercise. They also found there were no reports of adverse events in any of the four studies. On the other hand, another 2017 review published in the International Journal of Sports Medicine found the opposite to be true: cryotherapy did help to reduce soreness and improve recovery in athletes (more on this below). How does whole-body cryotherapy (WBC) work? What does cryotherapy do to your body? Cryotherapy is believed to work by reducing inflammatory processes, improving blood flow, and releasing feel-good endorphins. “Whole-body cryotherapy” involves a single or repeated exposure to extremely cold, dry air inside a special chamber or cabin. A cryotherapy chamber is an upright cylindrical capsule. It is padded on the inside of the chamber and closed around most of your body, but the top of the chamber remains open so your head stays out. From your neck down, very cold gas surrounds your body which is released from the chamber. Inside the cryotherapy chamber it gets extremely cold, typically around minus 100 degrees Fahrenheit — and in some cases down to a low temperature of minus 300 degrees. Staff workers set machines that control how cold the cryotherapy temperature will get and how long the session lasts. Once the chamber reaches a low temp (such as minus 100–300 degrees Fahrenheit) this will be sustained for only about 2-5 minutes. Inside the chamber you wear minimal clothing, usually gloves, a woolen headband covering the ears, a nose and mouth mask, dry shoes and socks, and boxers for men. This helps to reduce the risk of cold-related injury. Staff worker stand next to the chamber while you stand inside. From the inside you can push the door open if you feel you want to end the session before the expected time. If you’re doing WBC to help with exercise recovery, you’d ideally do a session within 0–24 hours after exercise. It’s recommended that sessions be repeated several times in the same day or multiple times over a number of weeks. Cryotherapy, cryosurgery and cryoablation are sometimes used interchangeably to describe the use of very cold temperatures to destroy harmful cells. Usually the term “cryosurgery” is reserved for cryotherapy that involves surgery. Whole-body cryotherapy does not involve surgery and does not require a doctor or medical procedure. Whole-body cryotherapy is therefore distinguished from “localized cryotherapy” because localized is more of an accepted medical practice that has been studied extensively. Cryosurgery is surgery using the local application of intense cold to destroy unwanted tissue. Extreme cold is produced by liquid nitrogen (or argon gas). Uses of cryosurgery/cryoablation include treating: pre-cancerous skin moles, nodules, skin tags, unsightly freckles, retinoblastomas (cancer of the retina in the eyes),atrial fibrillation (a type of heart rhythm disorder), and tumors in the prostate, liver, breasts, cervix, kidneys, lungs and bones. The most common use of cryosurgery is removing external and internal tumors, including those on the skin or inside the body that may be cancerous. Liquid nitrogen is applied directly to external tumors with a cotton swab or spraying device that causes the tissue the be destroyed. Cryosurgery is the surgical application of cryoablation inside the body. Cryoablation is performed using hollow needles called cryoprobes. Liquid nitrogen or argon gas is circulated through cryoprobes so it comes into contact with a tumor and freezes the abnormal cells. After cryosurgery the frozen tissue thaws and either dissolves or forms a scab. Are there side effects associated with cryosurgery? Usually they are not severe and only temporary, but side effects may include: light bleeding, cramps, mild pain, swelling, blisters, redness, and rarely scarring or hair loss. You’re probably already familiar with how cold packs and/or crushed ice provides effective short-term analgesia (pain relief) after injury or surgery. One of the most common reasons that people turn to cryotherapy is to prevent or treat muscle soreness after exercise, trauma or acute injuries. A report published in Frontiers in Physiology states that “whole body cryotherapy is a medical physical treatment widely used in sports medicine. Recovery from injuries (e.g., trauma, overuse) and after-season recovery are the main purposes for application.” Athletes and people dealing with injuries often try cryotherapy hoping that it will be a preventive strategy for reducing the effects of exercise-induced inflammation and soreness. A 2017 review that appeared in the International Journal of Sports Medicine, which included results from 16 eligible articles/studies, found evidence that cryotherapy helped reduce muscle pain (found in 80 percent of studies) and improved recovery in athletes and athletic capacity/performance (in 71 percent of studies). It also found that WBD didn’t cause side effects. The same review mentioned above also found evidence that cryotherapy benefits include reduction of systemic inflammation and lower concentrations of markers for muscle cell damage. (4) Overall, researchers involved in the review believe that cryotherapy can help improve recovery from muscle damage with multiple exposures. Multiple exposures were more likely to lead to improvements in recovery from pain, loss of muscle function, and markers of inflammation compared to single exposures/sessions. What is the use of cryotherapy when it comes to improving your mental health? Proponents of cryotherapy say that the sudden drop in temperature once you’re inside the chamber helps to release mood-lifting endorphins, which make you feel happier and more energetic (just like when you finish exercising and feel a natural “high,” or when you take an ice cold shower to activate your brown fat). WBC may make improve your mood because it counteracts pain, releases norepinephrine/adrenaline, facilitates mobilization and improves circulation. This seems plausible, but there hasn’t been much evidence proving it necessarily works for everyone. Because some studies have found that cryotherapy can help to reduce oxidative stress and inflammation, and to increase antioxidant status, it now being researched as a treatment method for preventing metabolic diseases, such as type 2 diabetes. In some ways, exposure to the cryotherapy mimics the effects of exercise since it positively impacts inflammatory pathways. One study that examined oxidative stress and antioxidant status in nonexercising participants found that those doing cryotherapy had an increase in antioxidant status associated in comparison to the untreated control group. Other studies have found that cryotherapy may help to build the body’s defenses against the negative impact of stress (an underlying cause of many diseases) and support the nervous system. It’s been found that right after a cryotherapy session there is a significant increases in nor-epinephrine concentration compared to resting controls, similarly to what happens with exercise. But this ultimately has a positive effect on some important cellular and physiological events associated with inflammation. When it comes to cryotherapy’s effects on the parasympathetic nervous system, which helps to calm the body after stress, studies have found that it has a large influence on parasympathetic reactivation, including improving heart-rate variability. Can Cryotherapy Help With Weight Loss? That being said, if you find that cryotherapy helps to lift your mood, boost your energy, reduce pain and help you stay more active, then it may possibly support your weight loss goals indirectly. The best way to find a cryotherapy center in your area is to ask around for a referral— such as from your physical therapist, chiropractor or doctor— or search online, for example using the database on the US Cryotherapy website. Depending on where you live, a whole-body cryotherapy session can cost somewhere in the range of $40-$100. Remember that sessions are typically very short, sometimes only a mere five minutes or less. While cryotherapy does seem to be safe for most people overall, you should be careful about which center you choose to visit in order to reduce your risk for side effects. Make sure you visit a reputable center that is licensed and operated by knowledgable staff. Discuss any concerns you may have beforehand, and even consider asking your doctor for advice or a recommendation first if you’re unsure. For cryosurgery treatments, ask your doctor for a recommendation or speak with your dermatologist. The type of medical professional you work with will depend on the goal of the treatment and condition being treated. Is cryotherapy definitely safe? What risk might be involved? There’s still some debate over whether cryotherapy machines are safe for the public. Overall most studies and reviews have found that there are no adverse events associated with WBC. While it’s only happened very rarely, deaths have been reported that have been linked to cryotherapy. For example, in 2015 The New York Times reported about a woman in Nevada who passed away following a full-body cryotherapy session. In other states within the U.S., people have filed lawsuits claiming that cryotherapy has caused injuries including frost bite, third degree burns and dibilliations. This has promoted government officials to further investigate the safety of cryotherapy centers. In certain situations WBC may not be safe. Contraindications of cryotherapy can include: uncontrolled hypertension, serious coronary disease, arrhythmia, circulatory disorders, Raynaud’s phenomenon (white fingers), cold allergies, serious pulmonary disease or the obstruction of the bronchus caused by a cold. Cryotherapy is a treatment that involves exposure to extremely cold air. It is used to reduce inflammation, destroy damaged tissue/cells, release endorphins and improve circulation. “Whole-body cryotherapy” involves a single or repeated exposure to extremely cold, dry air inside a special chamber or cabin for about 2–5 minutes. Cryotherapy chambers become extremely cold, dropping as low as minus 100 to minus 300 degrees Fahrenheit. At this time there is mixed opinions regarding the evidence showing that cryotherapy helps to treat symptoms like pain, soreness and poor recovery from exercise. Cryotherapy has not been shown in clinical studies to burn fat or cause weight loss. Potential benefits of cryotherapy according to some studies include: reduced pain and soreness, improved exercise recovery, mood enhancement, increased energy, and protection against metabolic diseases. Cryotherapy is generally safe and tends not to cause adverse effects, although in rare cases frostbite, burns and even death have occurred.